With the rise of food delivery apps, hotels are being forced to rethink their in-room dining. 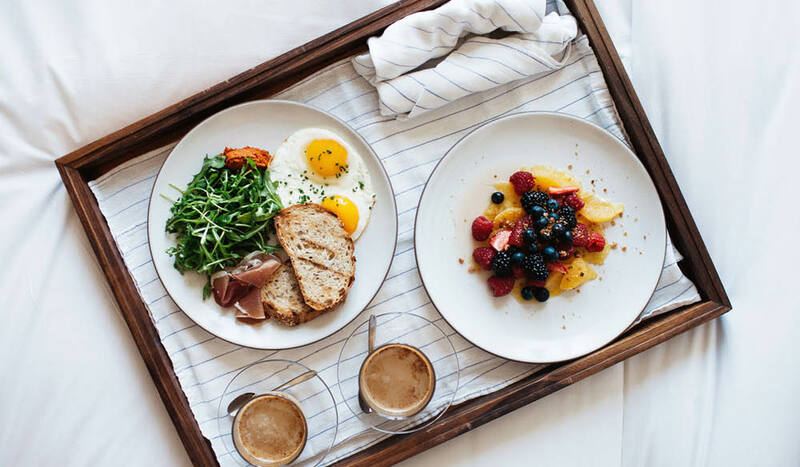 With the rise of food delivery apps, hotels around the world are being forced to turn the trolley tables and rethink in-room dining. So is room service really endangered or is it just getting a face-lift? Whether it’s for a celebratory bottle of Moët or a greasy late-night cheeseburger, the notion of room service still manages to capture fantasies of lavishness and indulgence. Who could forget the glee of a boofy-haired, white-robed Julia Roberts chewing on pancakes and picking at her breakfast croissant while Richard Gere read the business pages? Let’s be honest, we’ve all wanted to live out that scene. It doesn’t matter if you’re dialling ‘9’ in Phuket, Paris or Perth, the simple – yet irrational – act of summoning overpriced edible goods to your hotel room door at any hour always seems like a treat. While the end product might vary in its desirability upon delivery, the blinding mystique of luxury endures; somehow elevating a simple sandwich or glass of orange juice to luxurious new heights – at least in our imaginations. But despite the alluring sheen of extravagance, today’s world of UberEATS and Deliveroo means that overpriced hotel room service menus don’t always stand up as the best option for a lazy night in. According to Condé Nast Traveler, despite rising numbers of hotel guests overall, room service in the US has dropped by 25 percent in the past six years. Hotels are starting to wake up to the fact that today’s guests can swipe a jazzed-up souvlaki or a poke bowl onto the premises without too much hassle (just have a look and see who’s milling around hotel lobbies with boxy backpacks on their back these days – it’s a thing) so they’re having to get a little more creative to stay in the game. But is room service really going the way of the dodo or is it all just hotel hyperbole? Bures says that there’s still a market for room service in the same way that there is still a market for traditional fine dining restaurants – limited, but by no means extinct. Some hotels are upping their in-house dining offerings by providing grab-and-go style cafes or co-working-style workspaces with in-house baristas. But for the exhausted business traveller who just wants to switch on the telly and switch off the world, room service offers a rare chance to robe up, eat up and flop out. Forget club sandwiches and cold fries, QT Melbourne will happily let you order up a late-night jaffle with wild mushroom and raclette. Fancy a bottle of Macedon Ranges pinot to wash it down with? You’re on. If you’re in the mood for rice paper rolls, salumi boards, quinoa salad or a hangover-friendly breakfast roll with fried egg, bacon and aioli, you can have that too. So don’t desert your Pretty Woman fantasies just yet. Room service isn’t dead; it’s just having to wiggle over to make a little more room in the bed.